What makes something a go-to homemade bread recipe in my house? It has to taste good, it has to be easy, and it shouldn’t take all day. A simple recipe that doesn’t take a ton of ingredients is helpful, too! (Trust me, I’ve got complicated recipes I make, too. But this post is not for them!) I present to you my five favorite go-to homemade bread recipes that I use here at Clucky Dickens Farm. This bread has so many uses—one of which is eating straight from the oven with a stick of butter. 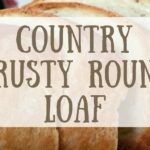 Crusty Round Loaf can work for small sandwiches but can also work as bread bowls for a soup or salad. You can bake it with an egg wash if you want a shiny crust, but it’s completely delicious and divine without the shiny crust. It’s up to you. I love One Rise Baguette because it’s super fast to make (you can knock it out from beginning to baked in 90 minutes). It’s the perfect bread to make when you find out someone is dropping by for dinner or when you remember you were supposed to bring bread to that one get together. There are a few ways we normally use this bread. First is for garlic bread: slice the long way, slap some butter and garlic along the inside, stick it back in the oven (wrapped in aluminum foil if that’s your thing) and warm it up until the butter is nice and melty. You can also make cheese bread with this bread by slicing the long way, spreading garlic and butter on the inside, sprinkling with mozarella cheese, and then setting in the oven (both sides open faced) and warming until the cheese melts. The third way we use this bread is for “hand sandwiches” —no, that’s not a typo. If you slice this bread the long way and then cut it into sections, you can make sandwiches, similar to sub sandwiches. The reason we’ve come to call them hand sandwiches is that you cannot eat a sandwich on this bread that is wider than your hand. It’s very filling, especially once you get all those sandwich ingredients on there! So the width of one hand has become our measuring stick when making sandwiches with these. Pro tip: Sticking your section of bread in the toaster oven or oven with a little butter and garlic before you put the sandwich together is super yumtastic. Just sayin’. I had a lot of people ask me for a recipe that was actually for sandwiches, and so I published a post on the only actual “sandwich bread” we make: Honey Wheat Sandwich Bread. You can make this with all white flour—I’ve done that when I’m out of wheat flour and don’t want to trek to the store. This recipe makes two loaves, but I usually double the recipe and can make 4-5 loaves. By the way, if you’re going to raise that much dough, you need something pretty big to raise your dough in. I’m lucky to have this super old bread dough riser thing that my parents found at an antique shop and bought as a Christmas gift for me many years ago. Yes, I understand you’re jealous. I’m jealous of myself sometimes. Somewhat related to honey wheat sandwich bread is a lovely recipe for honey wheat pan rolls. And yes, you can make these with all white flour. This is my go to recipe when someone asks me to “bring the buns” to a family get together. 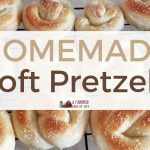 These rolls easy to make, they don’t take too long, and the recipe makes two 9×13 pans—24 rolls. If you’re looking for something a little different but something that isn’t going to take a ton more time, English Muffin Bread is a good choice. I love this bread because it has the consistency of English muffins without the work of making individual muffins. It bakes in a small casserole dish and is perfect for slicing, toasting, and slathering with butter and peanut butter. 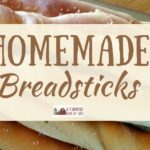 Homemade bread recipes are the best! I love all these homemade bread recipes. They really are my go-to choices when we need bread and I don’t have a ton of time. Hopefully these recipes can be your go-to homemade bread recipes, too. 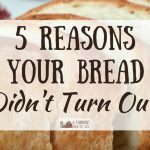 And hey, if you’re struggling with some kitchen gremlins and find that baking bread is a s-t-r-u-g-g-l-e, check out my article Five Reasons Your Bread Isn’t Turning Out. I love your bread recipes!! Especially the one rise baguette.